Chop and Mop. 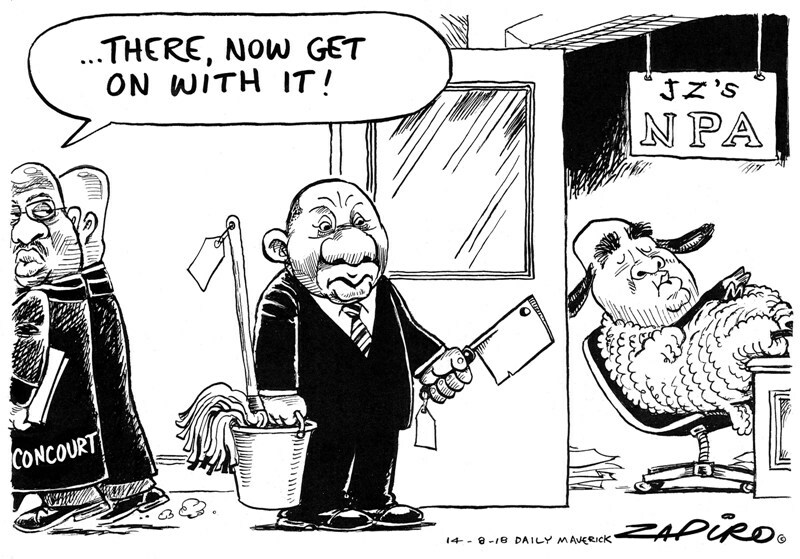 More of Zapiro’s brilliant work available at www.zapiro.com. NPA spokesperson Luvuyo Mfaku was adamant on Tuesday that the National Prosecuting Authority’s National Director of Public Prosecutions (NDPP) Shaun Abrahams had not reported to “work” after the Constitutional Court on Monday ruled his 2015 appointment legally invalid. “He is not working,” said Mfaku. Abrahams was in his office on Tuesday, but Mfaku said the controversial NPA boss’s contract ended immediately after Justice Mbuyiseli Madlanga delivered the judgment declaring former NDPP Mxolisi Nxasana’s termination and Abrahams’ appointment unconstitutional. “This week he is packing his office. He is doing a handover,” said Mfaku. One senior NPA staffer said it was “outrageous” that Abrahams turned up at all. He claimed the former NDPP was able to clear his office unsupervised while departing NDPPs were monitored to ensure they only removed personal information. Mfaku dismissed the claims as false and said they were made by someone with “uncontrollable ambitions” who wanted to lead the institution. “We are not going to be dictated to,” he said. Abrahams met Justice Minister Michael Masutha on Monday. The minister’s spokesperson Mukoni Ratshitanga said they had discussed the court judgment and its implications. President Cyril Ramaphosa on Tuesday announced that deputy NDPP Dr Silas Ramaite would act as NPA leader while he looks to appoint a new boss “well within” the 90-day deadline given by the Constitutional Court. Ramaite has been a deputy NDPP for 15 years and this will be his third time acting as NPA leader. “President Ramaphosa has wished Dr Ramaite well in his new role and expressed his belief that this week’s court judgment has set the NPA on a path that will restore the integrity of the Authority and build the nation’s confidence in the criminal justice system,” said the Presidency on Tuesday. Responding on Monday to the judgment, Ramaphosa said he would give urgent attention to leadership issues at the NPA to ensure the institution is stabilised and can perform its work unhindered. The president has the sole prerogative of appointing NDPPs. According to law, Ramaphosa could only choose one of four deputies as acting NDPP – Willie Hofmeyr, Nomgcobo Jiba, Nomvula Mokhatla or Ramaite. Ramaite made headlines in 2011 when he was arrested in Limpopo for drink-driving after he crashed his Jaguar into a bakkie. The charges were later withdrawn. He acted as NDPP between Nxasana’s exit and Abrahams’ appointment. His office at the NPA is responsible for administration and witness protection. In April, it was reported that Abrahams transferred an old friend to Ramaite’s office who lacked the requisite experience. The NPA denied the claims. Casac went to court with Freedom Under Law and Corruption Watch to have Nxasana’s termination and Abrahams’ appointment declared unlawful. DA shadow minister of justice and constitutional development Glynnis Breytenbach criticised the appointment. She claimed Ramaite had defended the NPA’s decision not to institute corruption charges against former President Jacob Zuma in the “spy tapes” case and admitted his involvement in dropping the charges. That decision has been overturned in court. “He has sat idly by while successive NDPPs and acting NDPPs, including Mokotedi Mpshe, Menzi Simelane, Nomgcobo Jiba and Shaun Abrahams, systematically destroyed the fabric of the NPA and South Africa’s criminal justice system. His track record proves that, at best, he is weak, vacillating and pliable,” said Breytenbach, a former NPA prosecutor. It’s unclear who Ramaphosa is considering as the next NDPP. One report suggested he is looking at three candidates: former NDPP Vusi Pikoli, Western Cape NPA director Advocate Rodney de Kock and former auditor general Terence Nombembe. Nombembe is probably ruled out because the NDPP must be an advocate and Pikoli has said he is not interested in returning to the post. In Monday’s judgment, Madlanga said when Zuma gave Nxasana a R17-million golden handshake the former president was effectively buying the NPA boss out of office. It compromised the independence of the NPA and allowed Zuma to remove an unwanted NDPP out of office. 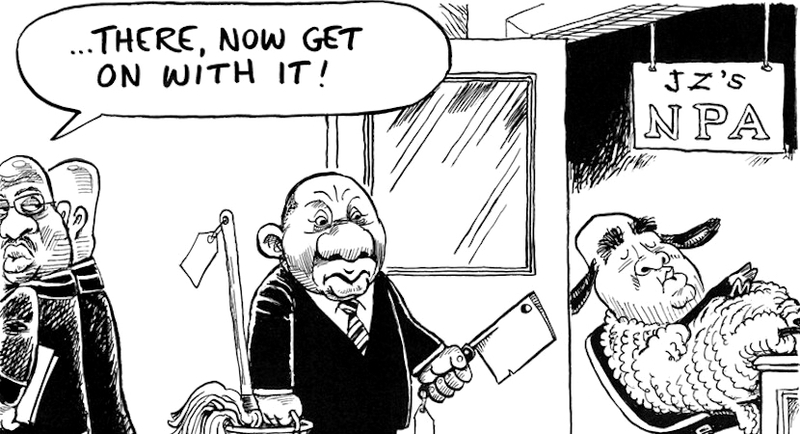 While Ramaphosa looks for a new NPA leader, he faces a number of hurdles in restoring the independence, impartiality and professionalism of the institution. Deputy NDPP Nomgcobo Jiba and senior prosecutor Lawrence Mrwebi are understood to be back at work after the Supreme Court of Appeal overturned a ruling that saw them disbarred. The Presidency announced this week that the pair have filed submissions on why they should not be suspended pending inquiries into their fitness to hold office. The case against them includes their decision to drop charges against former crime intelligence boss Richard Mdluli, dropping charges against Zuma regarding the spy tapes, and their actions in the case against former KwaZulu-Natal Hawks head Johan Booysen. Lawson said it was concerning that Jiba is still at the NPA.